Discussion in 'Art, Media & Photography' started by Isidore, May 21, 2018. Kinda new here (again) and wanted to share my latest non-musical hobby... Astrophotography. I shot this with a standard DSLR and 70-300mm lens (no telescope). It was sitting on my telescope's tracking head (Celestron AVX) and this is a combination of ~20min of exposure (combinations of 30s exposures). Anyhoo... hope you all enjoy. Given To Fly, Leviathus, tedtan and 5 others like this. When I was a kid, I used to do this with film. I used hydrogen gas to make the film expose faster and got extremely mixed results. I never got any photos of deep space objects anywhere near that quality. A big part of my problem was that I was using a 4" refraction telescope, which just doesn't grab as much light, but it has better magnification, so I was able to get a few decent shots of Jupiter, Saturn, and even Mars, and a few shots of the lunar surface with mylar filters. ...and a whole lot of wasted film. The fact that you got that without a telescope is super impressive, to me, at least. What telescope(s) do you have, though? Edika and Isidore like this. Awesome!! I eventually will get the gas filters. That's sooo great! I'm very new to astrophotography (I've only uploaded one videoclip of the Full Moon on my YouTube channel and it came out pretty bad, lol). Can you tell us what DSLR and 300mm lens were you using and at what F and SS ? Great pictures, really!!!! 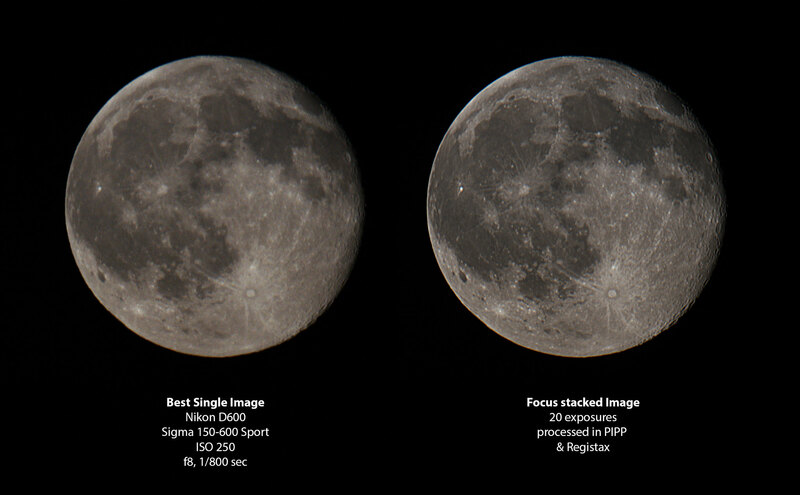 For your moon thing, you may have a better image than you think. Download these: a program called PIPP (Planetary Image Pre-Processor). PIPP can turn EVERY FRAME of the video into a tiff as well as center & align. AutoStakker3! or Registax. You take those images created by PIPP and load it into one of those and stack them. When it does that, it can bring out a LOT of details. Takes learning curve, but several resources out there. If you don't mind, i'm going to play with part of your footage. I just checked it out... you have a LOT to work with. I think you'll be really surprised at what you actually did capture. My 1st time taking a vid i did and stacking it blew my mind. Keep in mind, you're shooting at 25frames/sec. That means 25 pictures PER SECOND of footage. This is an example of what you can do with 20 images (less than 1s... not my image). Now imagine 2500 (+/- throw away frames). Alessandro - i took your vid and downloaded it (compressed youtube = not as clear as could be and reduced size of 720p). This is a stack of about 40 images (just shy of 2secs of footage). This is YOUR moon from YOUR after-youtube-compressed/shrunk video. You can do a LOT with that you have. Didn't spend a lot of time on it (work and all), but wanted to give you an idea of what you have available. If you were to do this same thing with your original footage, you'd probably get a fantastic result. PS: Def go back into registrax with whichever final image.... the wavelet sharpening feature it has is superb, even over photoshop and others. That's insanely wonderful! I'm checking out more in details everything you wrote, soon. Thank you so much!